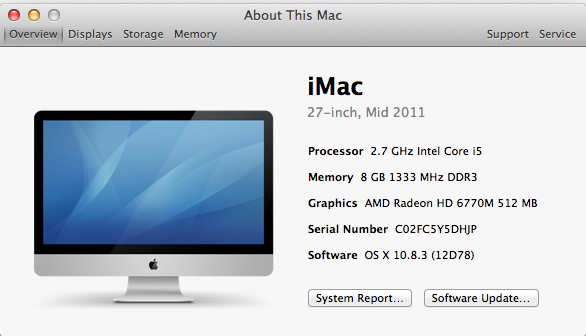 I have an iMac 12,2 27" mid 2010, Intel i5, 8GB RAM and AMD RADEON HD 6770M(512MB). I would like to know if it is possible to change the graphics card of this specific model to maybe an NVIDIA GeForce GTX 660 Ti | GeForce? Or does it have to be an ATI? I've been seeing alot of tutorials around for changing the graphics card but none for my specific model. Can you supply the last four digits of your serial number as you have conflicting information on what your system is. The 12,2 model is a mid '11 model not a mid '10. Mayer, does this mean that it can be modified or not? Because, not every model of iMac can have it's graphics card changed. that's why a firm and proper ID of which Machine you have is the starting point. Due to Firmware/Software updates you'd want to stick with an OEM or an "optional" OEM card, if indeed, it can be replaced. You might be able to upgrade to a 1 GB Radeon HD 6970M (a faster OEM card with more RAM)- if so this would be a very advanced DIY (basically tearing almost everything out of the machine, swapping the card, then reassembling). Though technically possible it might not be economically feasible... you'd be smarter IMHO selling this unit, ''take the proceeds along with what you'd have spent on a new graphics card to purchase a MacPRO//which is a much more user upgradeable machine. LiquidIce will be eternally grateful.